August 17, 2015 is a day I won’t forget easily. I spent the day on the ground in Central Bangkok, collecting photos and information for my up-coming Bangkok travel guide. At about 6:10pm, I tried texting my friend in order to organise a meeting place for dinner. However, for some reason, the internet was not working, notwithstanding that I had a full signal and 4G connection. By 6:45pm, in frustration at not being able to get the internet to work and feeling hungry, I boarded a skytrain away from the Erawan Shrine area. At 6:55pm, ten minutes later, a pipe bomb exploded on a bench in front of the Erawan Shrine, killing 20 people and maiming and injuring 125 more. It also damaged vehicles and destroyed several motorcycles. No one has claimed responsibility for the bombing, although the key suspect seems to be a Turkish based terrorism organisation known as the Grey Wolves. One Turkish national was arrested after his land-lady tipped off police, although he is not believed to be the person who actually deposited the bomb at the shrine. The remaining terrorists involved in the bombing are still at large and have most likely fled the country. The 17 August bombing is not the first tragedy to befall the area surrounding the Erawan Shrine and the Rajphrasong intersection. In fact, this particular part of Bangkok has experienced quite a lot of misfortune over the years. It all seems to start with the construction of the Erawan Hotel in the early 1950s. 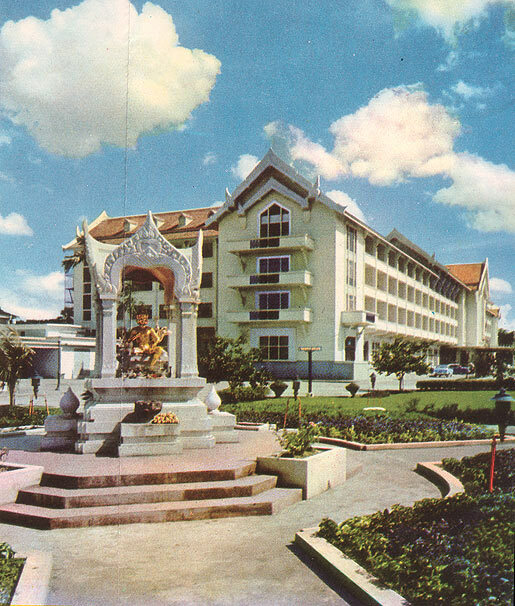 The intention was that this hotel, in what was then very much the outskirts of Bangkok, would rival the other luxury hotels of Asia, such as the Bangkok Oriental, Hong Kong Peninsula and Singapore Raffles. Unfortunately, the project was plagued with problems: construction costs blew out well beyond the original budget; numerous accidents took place on site, with many construction workers getting injured or dying; and the order of marble from Italy for the hotel (which cost a considerable amount) ended up sinking to the bottom of the ocean. The owners of the project took spiritual advise that stated that the site was plagued by bad karma and it would be necessary to appease the unhappy spirits by constructing a significant shrine and making offerings. The Thai government agreed to assist and the shrine (known in Thai as San Thao Maha Phrom) was designed and constructed under the supervision of the Department of Fine Arts. The statue chosen was that of Brahma, which interestingly is the Hindu god of creation and has nothing to do with Buddhism. In any event, after the shrine was commissioned and blessed in 1956, the problems befalling the area seemed to stop, at least for a time. In addition, the shrine quickly became a significant icon to Thais, who made offerings to it regularly, including commissioning Thai dancers to put on a performance. A lot of Thais, both pedestrians and motorists alike, also put their hands together in a wai (prayer like gesture) as they pass the shrine. In 1987, the original Erawan hotel was demolished and replaced with a more modern building and shopping centre on the same site, known as the Grand Hyatt Erawan. The new construction retained the original shrine, unaltered, other than adding some additional side features such as a shaded area (sala) for the dancers and for sale of merit items such as incense. In March 2006, the shrine was vandalized by a mentally ill Thai man, who smashed the statue of Brahma with a statue. He was subsequently killed by a mob of angry Thais. The original statue had to be replaced with a new one. The return of misfortune to the area started on 31 December 2006 at 6:00pm (and into the early hours of 1 January 2007 – at Central World). 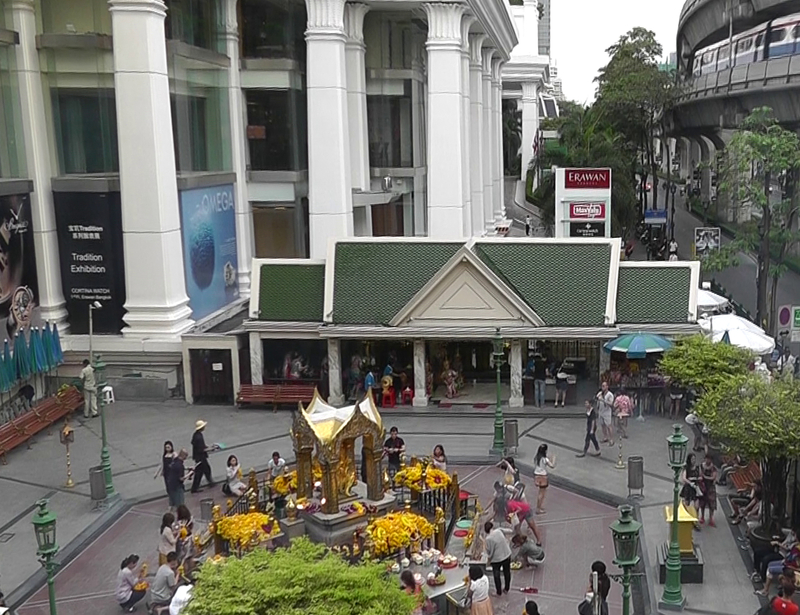 Various bombs went off around Bangkok during this period, including several just around the Erawan Shrine, including one diagonally across the road at Central World shopping centre, and one at the nearby boat pier. These bombing seemed to be internally politically motivated, although the initials for an Afghanistan based terrorist cell (IRK) were found inscribed at several of the bomb sites. The death toll was 3, with 38 others injured. The death toll could easily have been higher, but after the initial bombs went off at 6pm, the New Years Eve countdown at Central World (which attracts thousands if not tens of thousands) was cancelled. 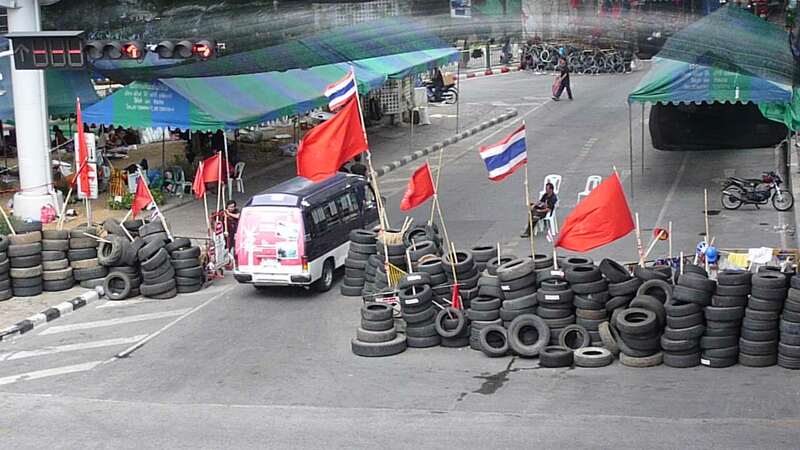 Further misfortune hit the area in April and May of 2010 when tens of thousands of “red shirt” pro-democracy demonstrators converged at the Rajphrasong intersection and effectively closed off that part of central Bangkok for a month. By May, the army moved in with soldiers, snipers and armoured personnel carriers, causing armed skirmishes and damage to buildings around the intersection including the Siam Cinema and Central World shopping centre. 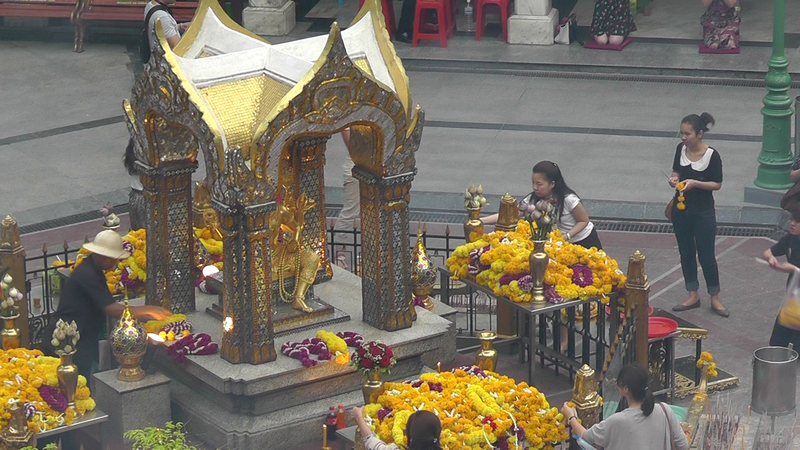 Interestingly, the Erawan Shrine itself was untouched. Over 100 people died in the area as a result of the incident. The area then had various minor incidents, including being occupied by further protesters (this time yellow shirts – who oppose any red shirt based government and instead seek a “quasi-democracy” controlled by an unelected council) in late 2013 and early 2014. There were various scuffles in the area at the time, such as when yellow shirts sought to restrict people from voting at what they considered to be illegitimate elections, but no real casualties. There have also been various foiled terrorism attempts that sought to target the area, including the Israeli embassy and Israeli nationals (which used to be located on Lang Suan Road, just a block away from the shrine) including the attempted bombing in 2012 and again in 2014. These were all linked back to Hezbolla. As a little footnote, there were also two terrorism incidents in the 1970s that occurred on this particular block; the first being the 1972 Black September invasion and hostage crisis at the Israeli Embassy and the second being an attempted bombing at the US embassy (but the truck carrying the bomb got stuck in traffic and when a police officer interrogated the driver, the terrorists abandoned the truck (at the Rajprasong intersection) and fled on foot. The above information is great food for conspiracy theorists, and tells quite a good tale. The more I look into the details, the more interesting things become. For example, the man who vandalized the shrine in 2006 evidently had Arabic tattoos and there was a lot of speculation at the time that he had been instructed to commit the vandalism, for one of a variety of reasons including to assist then Prime Minister Thaksin, for reasons of black magic, and for reasons of terrorism. Although I have added an air of mystery and conspiracy to this particular post, my personal views are that it is pure coincidence that all of the above events have taken place around the Erawan Shrine. The Shrine just happens to be located at one of the busiest intersections in Bangkok. In addition, it is a popular place for both locals and tourists. Tourists can see Thai dancing for free, Hindus and Buddhists can make merit (Chinese tourists in particular target the Erawan Shrine for this purpose). Because the area is a significant intersection with major hotels and Thailand’s largest shopping centre across the road; plus it is near the US, UK and former location of the Israeli embassy; and one of the most popular spots to celebrate New Years Eve, it becomes a natural choice for terrorist attack. It is however unfortunate that cowards choose to make their political points via needless death to innocent civilians. Notwithstanding my own close call (and this wasn’t my only close brush with being a victim to acts of terrorism) I continue to refuse to allow it to “terrorize” my behaviour and my travels.